On the 22nd (Sun), explore the historical opulence of Savonlinna Cathedral, look for gifts at Taito Shop Savonlinna, pick up some local products at Savonlinna Market Square, then make a trip to Pikkukirkko, then step into the grandiose world of Olavinlinna Castle, and finally see the interesting displays at Savonlinna Provincial Museum. 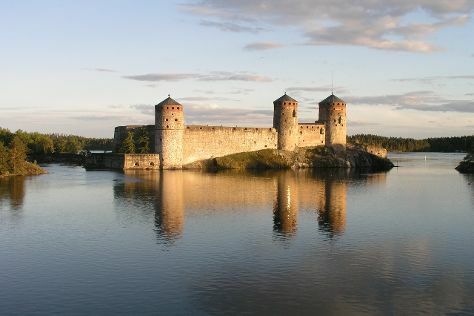 To see more things to do, ratings, other places to visit, and other tourist information, refer to the Savonlinna road trip tool . Kuala Lumpur, Malaysia to Savonlinna is an approximately 26-hour flight. You'll gain 6 hours traveling from Kuala Lumpur to Savonlinna due to the time zone difference. In December, Savonlinna is colder than Kuala Lumpur - with highs of -1°C and lows of -7°C. Wrap up your sightseeing on the 22nd (Sun) early enough to drive to Jyvaskyla. Jyväskylä is a city and municipality in Finland and in the western part of the Finnish Lakeland. Kick off your visit on the 23rd (Mon): test your team's savvy at popular escape rooms, look for gifts at Punnitse & Saasta, then examine the collection at The Craft Museum of Finland, then get a new perspective on nature at Natural History Museum of Central Finland, and finally take in the exciting artwork at Kuokkalan kartano. To see maps, other places to visit, ratings, and other tourist information, you can read our Jyvaskyla travel route app . Drive from Savonlinna to Jyvaskyla in 3 hours. Alternatively, you can do a combination of bus and train; or take a bus. In December in Jyvaskyla, expect temperatures between -2°C during the day and -8°C at night. Finish your sightseeing early on the 23rd (Mon) so you can take a train to Tampere. Head to Tallipihan Suklaapuoti and Galleria Rongafor some retail therapy. You'll discover tucked-away gems like Rauhaniemi Beach and The Finnish Labour Museum Werstas. Explore Tampere's surroundings by going to Haemeenlinna (Museo Militaria & Birthplace of Jean Sibelius). Next up on the itinerary: soothe aching muscles at some of the top local wellness centers, examine the collection at Tampere City Library, Metso, take in the architecture and atmosphere at Finlayson Church, and take in the spiritual surroundings of Tampere Cathedral. To find reviews, ratings, other places to visit, and other tourist information, you can read our Tampere trip builder tool . Traveling by train from Jyvaskyla to Tampere takes 2 hours. Alternatively, you can drive. December in Tampere sees daily highs of 0°C and lows of -6°C at night. Wrap up your sightseeing on the 26th (Thu) to allow time to drive to Kouvola. Kouvola is a town and municipality in southeastern Finland. On the 27th (Fri), take a peaceful walk through Niivermaki Nature Conservation Area, pause for some serene contemplation at Pyhan Ristin kirkko, then pause for some serene contemplation at Main Church, and finally explore the galleries of World Heritage Site - Verla Groundwood and Board Mill. Use Inspirock's suggestions to plan your Kouvola trip and find the best activities and attractions for your vacation. Traveling by car from Tampere to Kouvola takes 3 hours. Alternatively, you can do a combination of bus and train; or take a train. December in Kouvola sees daily highs of 0°C and lows of -3°C at night. Finish your sightseeing early on the 27th (Fri) so you can travel back home.